Overloading is considered to be an essential aspect of training for performance improvement and for this reason we tend to talk about Progressive Overload Theory in coaching courses. It is not that overloading is something to be avoided but it is inevitable that the motivated athlete will at some time push too hard, too often, and will fail to adequately recover between sessions. The result is often the occurrence of worrisome pain, soreness and/or stiffness focused in a particular part of the body. An easy example in Weightlifting would be the situation where an athlete pushes hard on squats over several weeks only to succumb to patella tendon soreness in either one or both knees. In Figure 1 below, “Case A” marks the typically observed scenario for an athlete noticing pain and soreness in a particular part of the body, the realisation that they have an injury and the action taken in the recovery process. Using the patella tendon soreness example, the athlete’s initial reaction to possible injury is a form of denial. In the early days of the injury, the athlete may attempt to continue training as normal and make statements such as “it’s okay, the pain goes away when I warm up – it’s not effecting me in my squats”. The athlete is often very reluctant to reduce training load for fear of losing strength and form, and after several sessions/weeks where the athlete employs various strategies to keep training hard, the athlete will begin to acknowledge that the injury won’t go away. Strategies that the athlete will employ to avoid load reduction include taking anti-inflammatory medication, strapping or bandaging the knees tightly, and attempting to compensate by altering squatting technique. This is a very frustrating time for the coach as well as the athlete. The coach will often recognize what is happening and will make efforts to provide timely advice to the athlete to significantly reduce loading on the injured part. However, the athlete will often comply with advice only when they have exhausted their own ideas and options. In Case A in Figure 1, during the period of denial, the athlete’s injury will worsen, strength is lost and anxiety is commonly suffered. This period may take many weeks during which there is a likelihood that the injury will become a significant impediment to the athlete’s preparation for their next competition. The effect on training will be more than simply continued pain and soreness as the athlete’s movement and coordination will often become inhibited resulting in a performance decrement in overhead lifts and confidence issues. At last, the athlete will recognize that specific intervention measures are required including, importantly, a visit to the physiotherapist for diagnosis. Upon confirmation from the physio, the athlete will eventually accept that rest or greatly reduced loading is required and, soon after, the injury will turn the corner and recovery starts. A better course of action is exemplified in Case B in Figure 1 above. The result is a significantly earlier recovery and a minimising of disruption to training. Pain should never be ignored in training, and experienced athletes learn to ‘listen’ to their body. At the onset of pain, for example in the patella tendon when squatting, immediate action should be taken to very significantly reduce loading. Athletes will tend to think that 10-20kg lighter will be sufficient but this is not a significant reduction in loading. In the patella tendon scenario, a more appropriate action would be to immediately cease squatting and full overhead movements, and replace training time on exercises where pain in the patella tendon is not experienced and/or there is much less loading in general on the body. Attempts to disguise the pain should be avoided as pain serves an important purpose. Every athlete in this situation is likely to question in their own mind whether they actually have an injury, whether there is anything at all to be worried about and whether they simply going soft in the head. 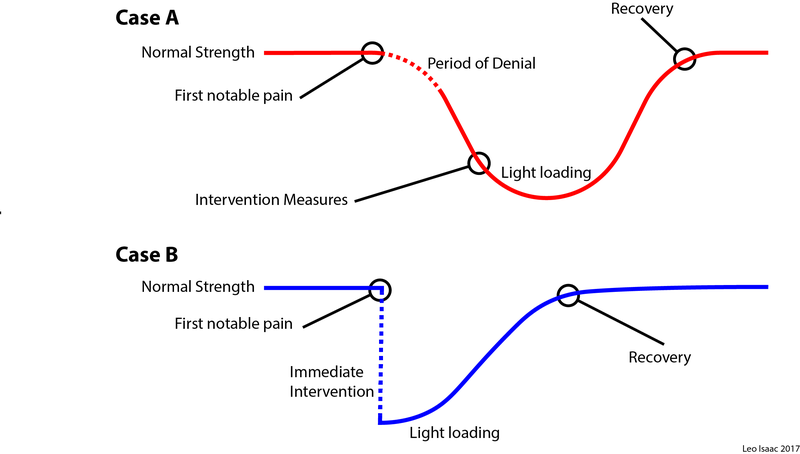 But in reality if immediate and significant action is taken upon the experience of pain, and it turns out to be a ‘false alarm’, there is very little long term detriment to training progress by erroneously reducing training for 1-2 sessions. The consequences of continuing to train at normal loading when a possible injury exists are far more problematic and far-reaching. Gradually increment the intensity of work on the injured body part from a very low base, making small increments each session over 1-3 weeks until full confidence is restored. If you superimpose Case B over Case A, the observed benefit of the Case B strategy is that recovery is effected in much less time. There is also a great deal of positivity involved. Owing to the initial severe cut back in loading on the injured body part, and then small session by session increments, the athlete will suffer much less anxiety about the course the injury will take. They will experience daily improvement and increasing confidence, and it does not take long before full-fitness is restored. On the other hand, in Case A, the athlete will experience negativity as the injury goes into the inevitable downward spiral and much time is lost in the recovery process. The axiom for athlete’s to consider is that the longer is takes to do something about the injury, the longer it takes to recover. This entry was posted in Physiology, Training Methodology by Leo Isaac. Bookmark the permalink.